There are also narrowly defined circumstances in which the UK implements its own sanctions, including combatting international terrorism. While the UK will continue to be required to implement UN sanctions through domestic legislation, Brexit will put paid to the automatic implementation of EU sanctions, leaving a potential gap in the UK’s sanctions programme. It is this lacuna that the act seeks to address, while also opening the door for the UK to develop its own autonomous programme once it is no longer subject to the EU’s common foreign and security policy. GTR: To what extent does the act extend the government’s powers, and what does this tell us about the powers the UK government seeks in preparation for a more autonomous role in the world? Enderby Smith: While not surprising given the purpose of the act, arguably the most striking feature of the new legislation is the substantial increase in powers it provides to the UK government. In its preamble, the act is said to “make provision enabling sanctions to be imposed where appropriate for the purposes of compliance with United Nations obligations or other international obligations or for the purposes of furthering the prevention of terrorism or for the purposes of national security or international peace and security or for the purposes of furthering foreign policy objectives”. A further amendment to the act also allows the UK to use sanctions to promote human rights. This is a wide-ranging mandate. Moreover, the act allows the UK government to designate persons by reference to a description rather than a specific name. While the government claims this power will only be exercised where it is unable to identify the relevant persons by name, this provision has raised concerns over potential uncertainty and the burden it will place on businesses and their compliance teams. The government says it will provide as much information as possible to help identify the appropriate individuals. However, the question remains how useful this will be in practice where the government itself has been unable to achieve effective identification. One could be forgiven for interpreting this simply as a means to give practical effect to foreign policy decisions about broad categories of persons the government wishes to be sanctioned. Also of note is that under the act the current EU requirement for sanctions to be reviewed annually is extended to every three years. Designated persons will still be able to challenge their designations, and the act also provides for a designation to be revoked if the government considers that the required conditions are not met in respect of the relevant designation “at any time”. However, this considerable extension of time between default reviews will no doubt shift the burden away from government and on to designated persons. Its inclusion is perhaps suggestive of a more heavy-handed sanctions programme post-Brexit. GTR: You mention the possible burden placed on businesses by the government’s increased powers. Are there any other ways the act may make life more difficult for third parties dealing with potentially sanctioned persons? Enderby Smith: Under the act, third-party institutions wishing to deal with potentially designated persons may find themselves facing increased reporting requirements. Currently only certain businesses are subject to reporting requirements in the UK, such as legal and financial services professionals. However, the government may use the act, through secondary legislation, to broaden such requirements to all natural and legal persons. They would be required to report to the government where they become aware, or have reasonable grounds to suspect, that they are dealing with a designated person or that an offence has been committed by a designated person. There would likely be criminal penalties for those who fail to comply. This development, coupled with the potential new problems interpreting the scope of sanctions that I mentioned previously, suggests that it may become more difficult for third parties to navigate the sanctions landscape. GTR: Given the act allows the UK government to forge its own path when it comes to its sanctions programme, which direction do you think it will choose to take? Enderby Smith: This is a political and diplomatic question. Sanctions are after all a stark expression of a country’s foreign policy objectives, and the UK’s approach will be heavily contingent on how it sees itself on the global stage post-Brexit. The UK government has strongly signalled its desire to continue to work closely with the EU post Brexit. In this respect, we may see the UK government simply using the act to replicate sanctions coming out of the EU. However, this may be unacceptable on a political level amongst those in favour of a cleaner break, and also on a practical level, with the difficulties implicit in seeking to align foreign policy objectives with those of 28 other countries without membership of a central administration. Another possibility is gravitation towards the US, in line with the two countries’ “special relationship”. This would be an interesting and not altogether unsurprising move, given the two countries often agree on matters of foreign policy, and the likely increased dependency the UK will have on the US once its ties with Europe are lessened. GTR: How might a move towards the US result in a different approach by the UK government to its sanctions regime? Enderby Smith: Such a move may result in a significant widening of the UK government’s application of sanctions, with broad-scope sanctions applying to whole geographical areas or whole groups of people – in contrast to the EU’s approach which has generally been to target individual sectors or persons. The wider powers granted under the act, and in particular the government’s ability to designate by description rather than by name, would certainly seem to allow for such expansion should the UK government see fit, and are perhaps telling of the government’s intended approach. Should the UK incline towards the US’ methods, it will be interesting to see whether it will also move towards the adoption of so-called secondary sanctions. Secondary sanctions “bite” on a sanctioning state’s citizens as with primary sanctions. However, persons are designated on the basis of who they do business with, essentially forcing them to make a choice between trading with the true target of the sanctions – for example an Iranian company – or the US. Thus a form of extraterritorial reach is achieved. 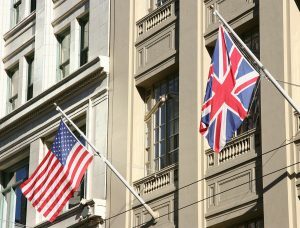 It is unlikely that secondary sanctions applied by the UK would be as effective as the US’, given the disparity in economic clout between the two nations. However, such a move would not be inconsequential and would herald a much more aggressive approach by the UK to matters of foreign policy. The post UK could move towards US-style sanctions regime after Brexit appeared first on Global Trade Review (GTR).